I'm [really] trying to keep my personal shopping to a minimum this month with Christmas coming up so soon! 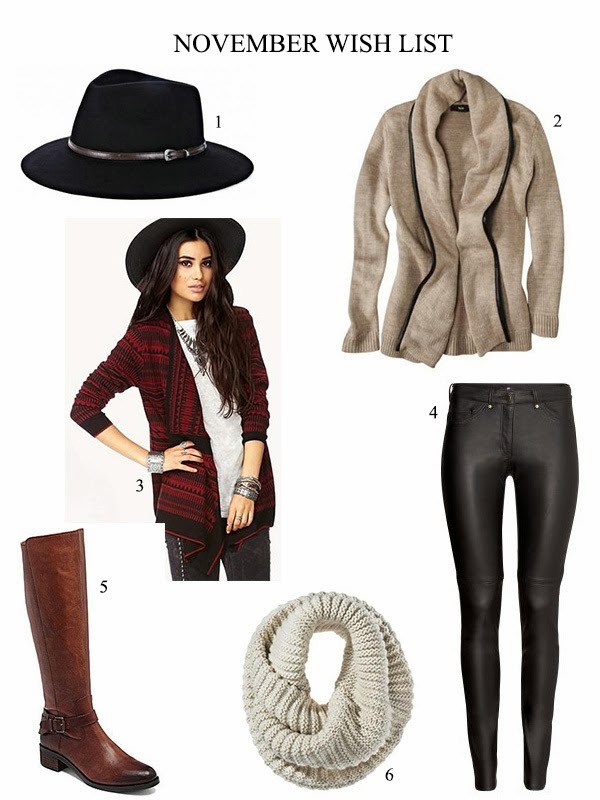 I have my eye on a few things of course though...cozy knits, some new riding boots and some fun leather skinnies. The verdict is still out on what I'll be buying in the next few weeks though, but I'm sure I'll get sucked into some Black Friday sales. PS ~ There are still a couple of days left to enter my jewelry giveaway! There are lots of easy ways to enter! Ok, everything on this wishlist needs to come to me now! Loving that hat and those pants! Gorgeous edit Jacy! love this cozy fall option! Cant wait to pull out my hats! I'm trying to minimize my shopping too. But I love both of the sweaters! Anything I come across now goes straight on my Christmas list. Those boots are so awesome–the color is perfect! I love the hat and the cream colored sweater! omigosh, BOOTS *-* They're absolutely gorgeous! Those leather pants... love!! And that cozy cardigan has a great Fall neutral color! Every year I majorly crush on a pair of riding boots I think these are the ones I'm loving this year! We have some of the same things on our wish-lists! I'm in need of some leather skinnies and new riding boots. I also love the cardigans!